Summer means one thing here in Minnesota: the great state fair is right around the corner! Consistently named one of the top state fairs in the entire country (usually occupying the top slot! ), the Minnesota State Fair was quite an eye opener for me when I first got here—and now I’m addicted. The bright colors, the amazing (but usually terrible for you) food, the fun games and rides—there’s something for everyone, and it brings out the kid in you. 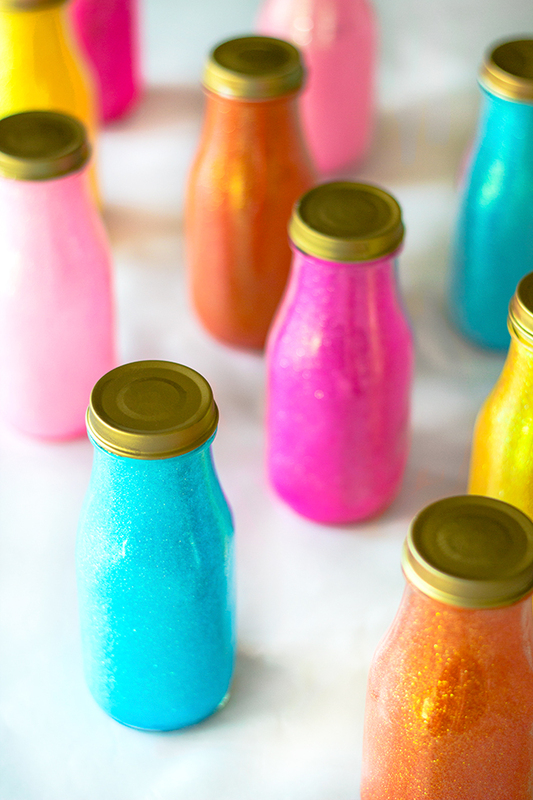 This DIY is a nod to the classic carnival milk bottle ring toss game but with a fun, sparkly spin. 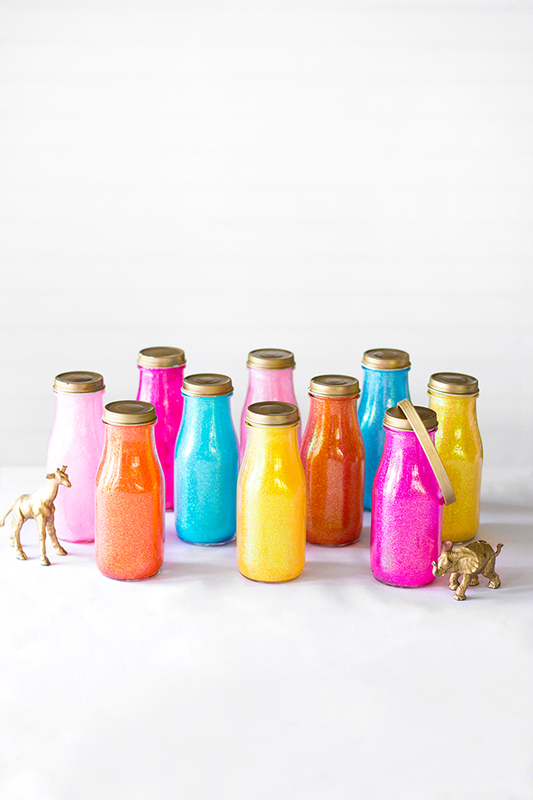 It’s easy to make and doesn’t take very long, and with some recycled bottles, it’s super inexpensive! It’s a great way to put together an outdoor activity the whole family will enjoy while brushing up on some skills in time for the fair! Step 1: Remove all of the labels from the bottles, and scrub the surface inside and out with soap and hot water. If needed, run the bottles through the dishwasher. While the bottles are drying and cooling, spray paint the bottle tops gold to mask any logos and give the bottles a pretty finishing touch. Step 2: Pour some Pledge Floor Finish into a bottle. 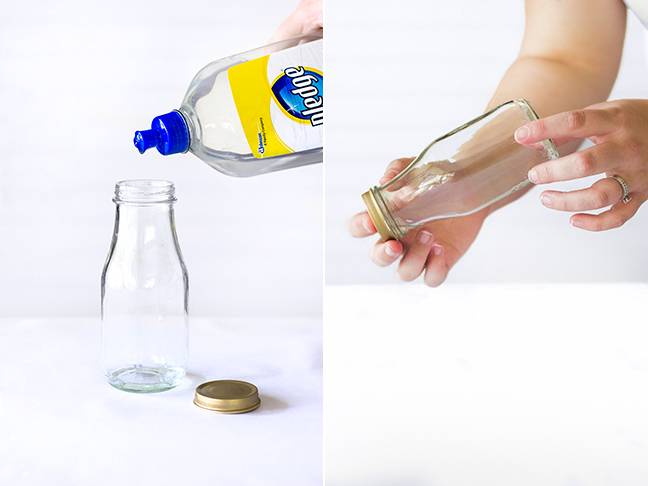 Close the bottle top tightly, then roll the Floor Finish around in the bottle to coat the entire interior of the bottle. Pour any excess back into the Pledge bottle. Step 3: Working quickly, pour in a generous amount of glitter. As with the Floor Finish, tightly close the cap and roll the glitter around the bottle. The drying Floor Finish will seal in the glitter. 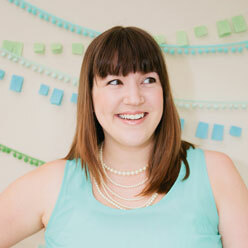 Check for any bare or thinly coated areas, then pour any excess glitter back into the glitter container. 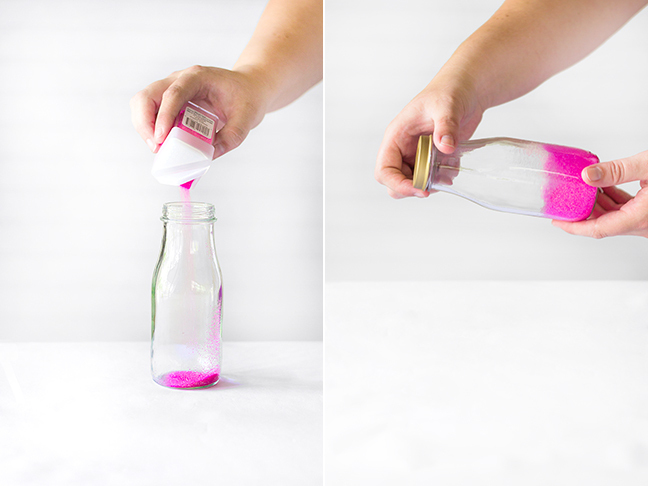 Repeat for the rest of your bottles, creating at least one for each color. Step 4: Open the embroidery hoops and remove the interior ring. Spray paint the ring gold and set aside to dry. Then you’re all done! Assign a number of points for each color, and start throwing! Whoever gets the most points after throwing all of their hoops wins the game!